Competitive search rankings are crucial to any small business in the process of customer acquisition and visibility. Where you rank when potential customers search for keywords related to your industry can be the difference between a click or a pass, which can be equal to a sale for you or your competitors. The idea of search engine optimization may not be a foreign concept, but a successful execution can be complicated work. Here we’re going to break down key concepts like head terms and referring domains and show you how they play out in six competitive industries. If you’re looking to increase your site’s search rankings and traffic, continue reading to see how you can make SEO work for you. Sometimes building your web presence can be difficult, and when major competitors are among the highest ranked webpages in search engine results, it can seem even more complicated. In the six major industries researched, there was a greater presence of unique domains in some areas. 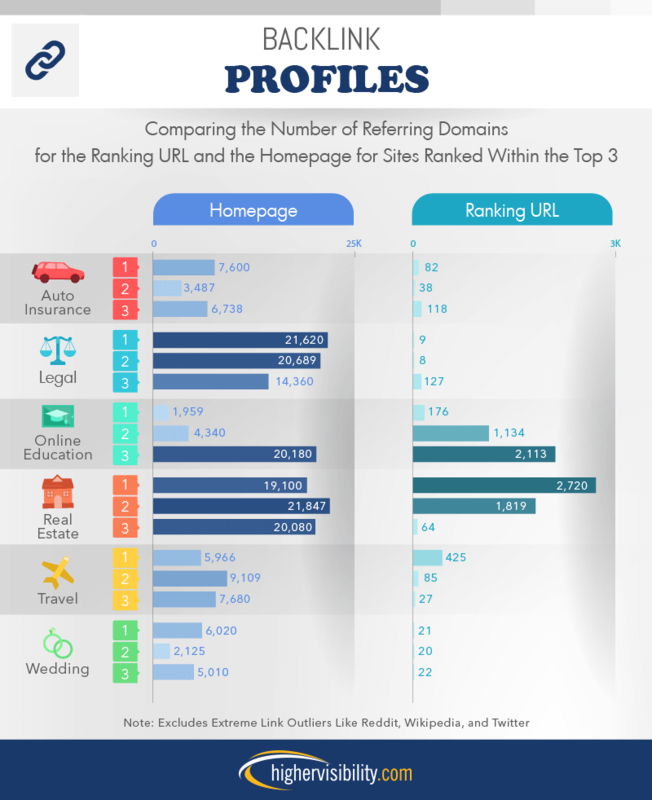 Of the 50 highest ranked sites when searching for key legal terms, there were 39 unique domains, such as divorcenet.com, rocketlawyer.com, and lawyers.findlaw.com. Other industries, like online education, wedding-based sites, and travel, had a similar level of diversification, suggesting no one or two companies have a hold on the web presence of these industries. On the other end of the spectrum, of the top 50 sites for auto insurance, there were only 16 unique domains. With big players in the auto insurance game, their web presence takes up the bulk of top spots when searched for, making auto insurance a harder field to create visibility for smaller or different brands. Ranking the highest for insurance providers were thegeneral.com, progressive.com, and libertymutual.com. Sorry, statefarm.com! If there’s room in your industry for competitive online marketing, expanding your web presence to capitalize on as many points of entry as you can is a smart way to increase traffic and expand your sphere of customer influence. Once you do, what becomes more popular – your homepage or the subdirectories that expand on your landing page? 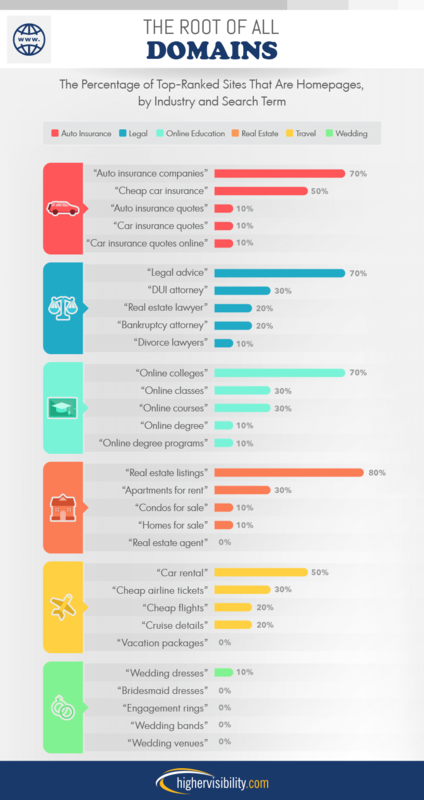 We found businesses focused on auto insurance, legal services, and online education were industries where the homepage accounted for almost a third of their top ranked sites. For companies in these fields, your homepage is more likely to account for a higher percentage of your search traffic and should be used to introduce customers to the most important services and products your brand offers. You can begin to break this down even further by industry to see how many of the popular keyword searches connected internet users with homepages. For example, if you were rent.com, one of the top domains in the real estate industry, you’d be competing with the 80 percent of results for “real estate listings” pulling unique homepages These searches become less populated with these domains when you start to narrow your focus, i.e. looking to buy condos returns results where only 10 percent are homepages. Your site’s total traffic isn’t just composed of direct online searches or clicks to your homepage page. There can be significant viewership opportunities from other referral sources like referring domains and backlinks. Referring domains are other sites that bring you traffic, and backlinks are the links a customer clicks on from these domains to be brought to yours. Key search terms are one of the main ways to ensure your potential customers are making their way to your website. However, there are certain words or phrases that will spark more competition depending on your industry. Top travel websites mention “car rental” over 35 times on average within the main page and as a part of the code. While it may be lucrative or a great value-add to include links to car rentals, trying to improve your rank with this specific keyword could prove to be a challenging endeavor. It would be easier to try and target terms less frequently in both locations, such as “cheap flights,” where on average it is found less than 10 times on a page and fewer than 20 mentions in the HTML code. Similar to travel, top real estate websites employ a few keywords on the page and in the code. “Real estate agent” is the most frequently mentioned phrase in the code constructing the site and throughout the page’s contents. Other popular phrases within the real estate sector are “apartments for rent,” which receives more attention in the website code, compared with “homes for sale” which receives more callouts in the main page text. If you’re thinking about including these terms in either your webpage or its code, full search terms may be more beneficial in helping to boost your search ranking than trying to create a play on those words and wedging them into your page’s layout. When it comes to settling on a homepage or even subdomains for popular pages, adding part of a search term to your URL, or even composing your URL entirely from these words, can earn more clicks and higher search optimization. Because keywords, like search terms, can show up in general search results, they may help with placement and user credibility on deciding which pages to open. But this isn’t a guarantee. Over 50 percent of the top ranked search results for the keywords above with only a partial match in the URL (i.e. you search for “online education,” but the URL only contains “education”) had a below-average match to the phrase. For example, two of the top results in different industries – auto insurance and real estate – typically averaged less of a match than the four other fields of business. However, these are the outliers for the top-ranked spot: The other four matched 100 percent. If you’re looking for that coveted No. 1 spot, work on connecting that URL back to the search terms for as close a match as possible to the search phrase you’re looking to appear beneath in various search engines. All data were pulled from semrush.com. We examined the top three ranked sites and looked at five of the most searched terms across six industries between Feb. 17 and 21, 2017. We looked at six competitive industries and took five of the most searched terms within those industries to analyze the 10 top-ranking URLs. We like to see our work at the top of search rankings, just like you. Feel free to share the findings of our research with your readers in any noncommercial capacity; just ensure a backlink to this page so our contributors earn credit for their work.